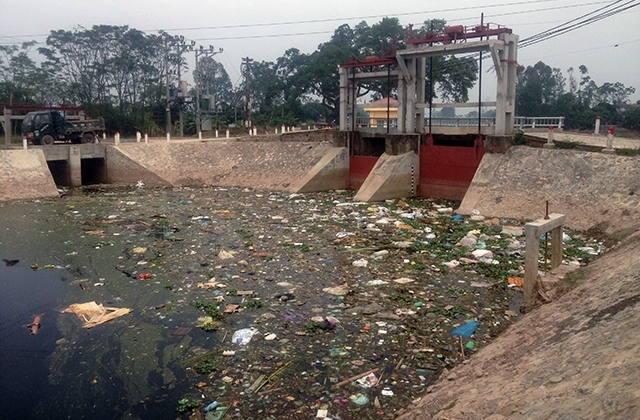 Garbage pollutes Sai Thi River (in Bac Hung Hai river system) in Thuan Hung commune (Khoai Chau, Hung Yen). According to readers, in recent times, the surface water pollution in the Bac Hung Hai irrigation system, through the territory of Hung Yen province, it has become more serious, adversely affecting agricultural production and People's life. Prior to this situation, the authorities should soon find out the causes of pollution and severely deal with production facilities, factories discharge. Bac Hung Hai river system (BHH) was built in 1958 with the total length of the main river system of 232 km and more than 2,000 km of canals of all kinds, mainly in Hung Yen, Hai Duong and Bac Ninh provinces. The water supply for the BHH system is taken from the Red River through Xuan Quan drainage, Van Giang district, Hung Yen province, for irrigation and drainage of about 110 thousand hectares of rice, cash crops and industrial crops; Water supply for livestock, fisheries and drinking water for people in the area. The BHH river system in Hung Yen province has main rivers and tributaries with a total length of more than 100 km, providing water for about 50,000 ha of cultivated land and aquaculture ponds. The BHH system is built with the main purpose of supplying irrigation and drainage for agricultural production; However, in the process of developing urbanization and industrialization, the BHH river system now has to take over the function of receiving waste water from people, wastewater from production, business and service units and diseases, not to mention hospitals, craft villages, livestock facilities, and garbage. In Hung Yen province, the total waste that is discharged into the environment is about 134,401 m3 / day , mainly discharged into BHH river and tributaries; Of which, wastewater from industrial parks, clusters and production, business and service establishments accounts for 28%; Wastewater from health facilities accounts for 2%; Wastewater from residential areas, craft villages, small production, business and service establishments, livestock establishments account for 70%. Most untreated or treated wastewater is not up to standards. In addition, at the head of the BHH river is the polluted water, services, handicraft villages and people who along the Cau Bai river basin which runs through Long Bien, district and Gia Lam district. Interior) through Xuan Thuy drainage. This also causes the BHH river water source to be seriously polluted. Cau's river is black, often white effervescent discharge into the BHH river, with increasing frequency; Each week two to three times, each lasting one to two days. Deputy Director of Hung Yen Department of Natural Resources and Environment Tran Dang Anh said that the main reason for the above situation is that the BHH river system has to receive more wastewater sources with higher volume, especially waste water that has not been treated properly. The BHH River system is often closed to store water, so the situation of stagnant water, not circulation, mainly in the dry season also contributes to pollution. The enforcement of the law on environmental protection has not been strict, lack of close coordination between provinces and cities in the management and treatment of water pollution discharge. In response to this situation, Hung Yen has taken measures to prevent and minimize environmental pollution on the BHH river system as stipulated in the agreement, deploying a model for sorting and treating organic household wastes. Furthermore, the installation of automatic data acquisition system, and automatic monitoring device for wastewater treatment, provides an increase inspection and supervision of compliance Environmental protection regulations, dealing with acts that pollute the environment. However, implementation of effective environmental protection solutions are not high; especially the prevention of water pollution from the Cau river to the BHH river system. Therefore, in order to deal with pollution and improve the water environment of the BHH river, it is necessary to take part in and coordinate with ministries, sectors and localities to renovate and upgrade the entire BHH. The function of irrigation and drainage for agricultural production now has the function of draining wastewater for industry and people in the industrialization and modernization of fast-growing areas. Establishing an automatic monitoring network to assess the quality of irrigation water on the BHH river system and send these results to the provinces and cities within the BHH river system, to warn people, organizations and individuals involved in inter-agency activities. People must examine, evaluate and determine the cause of the contaminated water in Cau River; to intensify the inspection and examination according to its competence of the environmental protection, business and service establishments, especially establishments which generate large wastewater discharging into the river system. The early Investment, construction and operation of urban wastewater treatment works in Long Bien district in accordance with the plan of the Hanoi People's Committee on the development of urban waste water collection and treatment system. The regulators exchange and share information on the situation of sources of discharge of wastewater into the river, and the quality of river water, and the measures already taken to overcome the pollution of river water. "Bac Hung Hai river system in Hung Yen province has nine rivers and canals (25% of the total of rivers, canals and surveys are in Hung Yen province). 15 rivers have medium pollution channels In 2015 and 2016. After collecting 165 surface water samples, and analyzing 19 environmental indicators, the results showed that 100% of surface water samples had norms. The analysis exceeds all technical standards, in which many indicators exceeded national technical standards on the environment from several times to dozens of times ... ". "Bac Hung Hai river water is severely polluted affecting people's health, we think that the main reason is that some factories in the area discharge and polluteby products fromtheir factories. We are requesting the functional agencies to strictly treat enterprises who are deliberately violating the law on environmental protection.